The holy, glorious and right-victorious Great-martyr John the New of Suceava (Romanian: Sf. Mare Mucenic Ioan cel Nou de la Suceava), was a Romanian saint of the 14th century. His feast days are celebrated on June 2 and June 24. 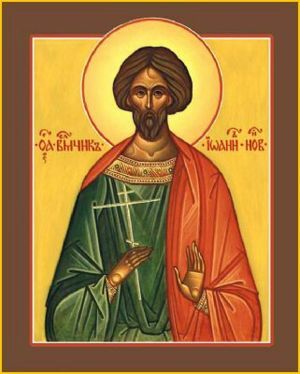 St. John was born in Trebizond in Asia Minor in about 1300 to devout Orthodox parents. His father was a merchant and John followed in his footsteps. On a trading trip to Cetatea Albă, then part of Moldova but now Bilhorod-Dnistrovs'kyy in the Ukraine, he got to know a Venetian merchant named Reiz whilst they were sailing on the Black Sea. They discussed the faith many times and, seeing that John always defeated his arguments, the Venetian decided to take revenge. On arriving in Cetatea Albă, Reiz spread a rumor that John, despite being raised Christian, was interested in the Muslim faith. Cetatea Albă at that time had been conquered by Muslim Tartars, and when their ruler heard the rumor he called for John. He was taken before the ruler and asked if it was true that he wished to deny the Christian faith and become a Muslim. He responded that he would never give up his faith in the true God in order to worship created things or the inventions of men. This response offended the Tartar ruler, who ordered John to renounce his faith on pain of torture. He refused to do so, enduring many beatings, and was eventually martyred by being dragged behind a horse through the streets of the city before having his head struck off by a 'fanatical Jew'. The year was 1330 and John was only about 30 years old. On hearing of his death, Reiz resolved to dig up the body of the martyr and steal it as a further act of revenge, but the Orthodox priest in the city had a dream in which John who informed him of this crime and asked him to bring his body to the Orthodox Church. This was the first miracle of the great martyr. For years his relics were kept in Cetatea Albă, where they became famous for healings and other miracles, but eventually Prince (Voievod) Alexander the Good (Alexandru cel Bun) heard of the martyr's relics and, at the urging of Metropolitan Joseph (Iosif) Muşat of Moldova, arranged to have them brought to his capital, Suceava, on June 24, 1402. John's incorrupt relics have been kept at the monastery bearing his name in that city until the present. St. John the New is one of the most venerated saints in Moldova, and many miracles are associated with his relics. This page was last edited on October 22, 2012, at 20:27. This page has been accessed 23,168 times.